Myrtle Beach, SC | Ocean Lakes Golf Cars has earned Club Car’s coveted Black & Gold Elite status. The award is given for its exemplary performance and customer service to Grand Strand residents and guests at Ocean Lakes Family Campground in 2017. 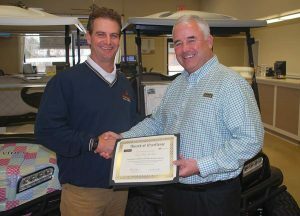 Ben McElmurray, right, Club Car’s Regional Manager of Commercial, Turf & Retail Sales for the Southeast Region, presents the Black & Gold Elite certificate to Greg Bender, Manager of Ocean Lakes Golf Cars. The distinction puts Ocean Lakes Golf Cars in the top 10 percent of Club Car dealers worldwide. To earn Elite status, Ocean Lakes Golf Cars had to excel in several goals. It achieved extraordinary levels of sales and service, demonstrated exceptional financial performance, implemented successful marketing strategies and maintained top-notch facilities. Ocean Lakes Golf Cars has been affiliated with Club Car for more than 15 years, featuring the brand in its extensive rental car fleet. It started selling new Club Cars as a dealer in 2015. Club Car, a brand of Ingersoll Rand, celebrates its 60th anniversary this year. While Ocean Lakes Golf Cars is located inside Ocean Lakes Family Campground, it serves more than just campground guests. Locals turn to Ocean Lakes Golf Cars to buy new, used and refurbished golf cars. They also work with the Golf Cars team to create a custom golf car with the colors, theme and look that fits them perfectly. Ocean Lakes Golf Cars also has an extensive parts, accessories and service department to accommodate all major brands of golf cars. The Elite status is a sign to customers that they’ll find an extensive inventory of golf cars available. It let’s customers know they are dealing with expert technicians with extensive knowledge about the cars. They can count on receiving outstanding customer service. “When a guest buys a car from us, they know exactly what they’ll be getting,” said Greg Bender, manager of Ocean Lakes Golf Cars. Bender, who has worked at Ocean Lakes for 30 years, credited the Ocean Lakes Golf Cars team with embracing the culture of providing exceptional customer service instilled by Ocean Lakes Family Campground co-founders Mary Emily and Nelson Jackson. They passed away in 2010 but their legacy still lives on. “It’s been a total team effort, and it starts with customer service,” Bender said. Ocean Lakes Golf Cars, a division of The Jackson Companies, sells a variety of new, used and refurbished golf cars and accessories; handles a rental fleet of 900 golf cars and has a factory-trained team to service and repair golf cars. A certified Club Car dealer, Ocean Lakes Golf Cars also creates custom golf cars in a variety of colors and themes – from sports teams to beach lifestyles. In 2017, Ocean Lakes Golf Cars earned Black & Gold Elite status from Club Car for its exemplary performance. Ocean Lakes Golf Cars is located inside Ocean Lakes Family Campground at 6001 S. Kings Highway, Myrtle Beach, SC. Learn more at www.OceanLakesGolfCars.com or 843-238-8841.